The Tanzanian graphite pool which already features Magnis Resources (ASX:MNS) and Kibaran Resources (ASX:KBL) is swirling with activity. Several Tanzanian graphite explorers have seen their valuations start to move up including Black Rock Mining (ASX:BKT). At the same time this is minerals exploration and continued success is no guarantee. Well, we are back to update you on BKT because there are a few more catalysts on the horizon in the coming weeks – All of which have the potential for another rapid BKT share price movement. A $5M placement from sophisticated and professional investors was recently completed by BKT, which will allow the Company what it needs to finalise a JORC graphite resource at its Mahenge Project and to complete scoping studies. BKT Non-Executive Chairman and ‘fast food baron’ Steve Copulos has stumped up $1M of his own money, such is his confidence in the project. BKT’s Mahenge Project includes three key graphite prospects – Epanko North, Cascade, Ulzani which will be significantly explored over the coming week and months. Funds will also be used for the acquisition and exploration of the new Bagamoyo Graphite Project and we expect a steady stream of news over the coming months from this new, underexplored graphite project also. BKT’s planned drilling programme for the rest of 2015 sees 30 more drill holes as a minimum – to be drilled at Ulanzi and Cascade. December: Results from the metallurgical test-work which is currently underway for Ulanzi and Epanko North graphite ore bodies. Over the coming months, BKT will also apply to the ASX to seek quotation of the options forming part of the recently completed equity raising. As you can see BKT is turning its wheels pretty quickly in line with graphite becoming a hot commodity particularly as new lithium-ion batteries start to become mass-produced products. At the same time, Tanzania as a country does have particular political and social risks which can hinder projects from advancing. Being a small explorer with assets here means that BKT is a high risk stock. Will BKT be able to take advantage of its current position? The coming weeks will be crucial. BKT is actively exploring for graphite at its flagship Mahenge Project – next door to $36M capped Kibaran Resources’ (ASX: KNL) graphite orebody – which holds 2,194,600 tonnes of contained graphite. BKT’S direct neighbour Kibaran has already sealed a 10 year offtake agreement with German ThyssenKrupp for a minimum sale of 20,000 tonnes per annum of refractory grade natural graphite. Within BKT’s Mahenge Project lie two compelling graphite prospects being drilled into right now – the Cascade Prospect and the Ulzani Prospect – and each one has potential to be a standalone graphite resource. Together, they are expected to account for over 70% of BKT’s graphite tonnage as and when its resource is JORC defined. In addition, BKT is working on defining a JORC resource at a third prospect – Epanko North, which is due by the end of the year. Last but not least is BKT’s new Bagamoyo Project which potentially expands, and most definitely diversifies, BKT’s activities. In fact, we are expecting to see BKT continue its exploration and if its results prove to be as optimistic as the ones we’ve seen so far, we could yet see BKT back in the Catalyst Hunter crosshairs again soon. 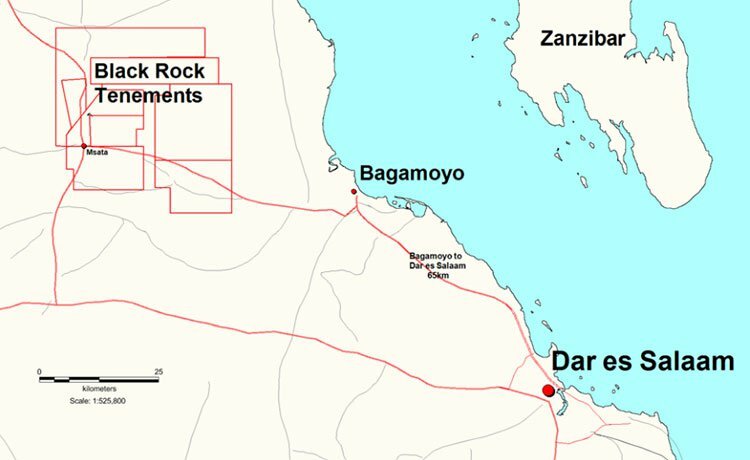 BKT has signed an option agreement to acquire the entirely new (and highly prospective) Bagamoyo Project in Tanzania, covering a total area of 1,116km 2 . The Bagamoyo Project is located approximately 125km north-west of Dar es Salaam port and has top-notch infrastructure in the surrounding area – already catering for an established aggregates, sand and building export industry. Initial exploration shows significant coarse flake graphite covering an area of 1km x 200m of outcrop and extensive float rock. Graphitic mineralisation is confirmed as flat lying to shallow dipping on relatively flat ground, with an observed thickness of 30m. Graphite flake size is typically 2-7mm with many samples showing >10mm. The indicative graphite grade at Bagamoyo is 7% TGC (lower than Mahenge) but with significantly coarser flake. Further analysis has been initiated and adds to the growing list of catalysts for this multifaceted junior explorer. The Bagamoyo Project contains 7 contiguous mineral exploration permits and will be worked on alongside BKT’s flagship Mahenge project. According to BKT, Bagamoyo contains “the coarsest flake graphite the Company [BKT] has observed in Tanzania”. As and when this is corroborated by drilling and assay results, BKT is likely to be revalued upwards on the expectations that its total resource will be larger than first thought (and growing). However growth is not a given for BKT in this situation and success remains speculative. BKT’s Managing Director, Steve Tambanis believes the Company will complete “mapping and evaluation of the central zone by late November , followed by drilling to evaluate the depth and extent of graphite mineralisation”. The Bagamoyo Project broadens BKT’s graphite tenure portfolio in Tanzania and offers upside potential to shareholders as an ultra-coarse flake graphite project. In a recent market update, BKT expanded its total initial exploration target at Mahenge from 30-60Mt to 84-115Mt with a TGC range of 8.66%-10.34% – almost double the previous estimate. Tanzania sits on top of the largest source of graphite mineralisation in the world, close to the famous Cabo Delgado region in Mozambique. There’s more graphite in this part of East Africa than the rest of the world combined. BKT secured in excess of 1,500km 2 of tenements earlier this year and has quickly progressed with trenching and infill drilling to fast-track its commercial potential. Its total land tenure has now grown to over 2,500km 2 . BKT is moving full throttle on several prospects simultaneously. All have high grade graphite mineralisation confirmed both visually and through rock chip samples, assays and drilling. BKT has discovered more than 3km of graphite mineralisation at Epanko North, most likely along the same north-south trending lode structures of KBL’s 22.8Mt orebody. So far, there’s been over 1500m of trenching done and BKT has completed a drill out programme with approximately 4000m of drilling undertaken to date. More assay results are on their way. BKT’s exploration target here is 21-32Mt @ at a grade range of 5.85% – 9.15% TGC (Total Graphitic Carbon). BKT is aiming to simultaneously announce a JORC resource at Epanko North and Ulzani – however we will have to wait and see how the exploration unfolds. This prospect is newly discovered with the first six RC holes indicating high grade graphite, as confirmed by visual analysis. The Cascade prospect has the potential to be both larger in size and higher in grade than Epanko North. BKT’s exploration target at Cascade is 22-30Mt at 9.25%-10.41% TGC. 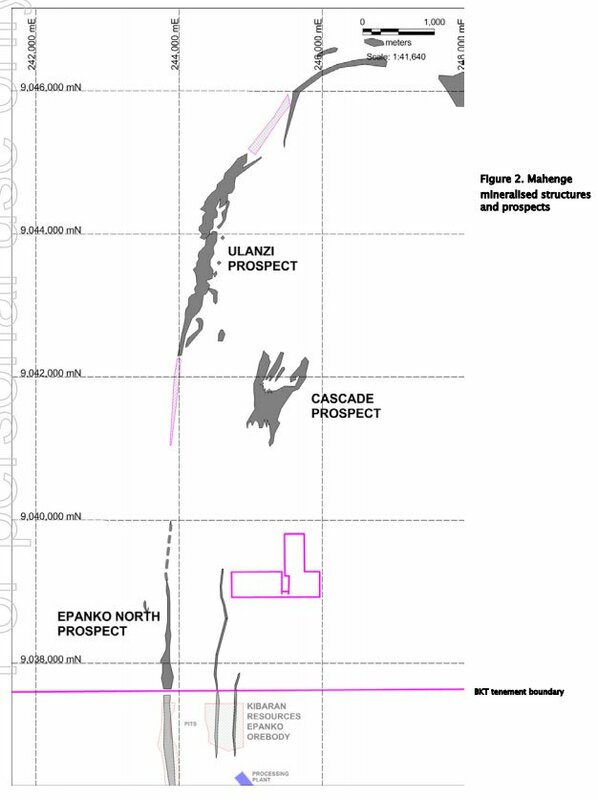 This is BKT’s most recent discovery so exploration is behind what’s happening at Epanko and Cascade. However, the results seen here give reason for optimism. Mapped out below is an overlay of combined test pit, trench and rock chip samples. The 3km mineralised zone (shown in dark grey) is currently open to the north and south – an open-ended catalyst source. The 140 test pit samples examined so far have averaged over 11% TGC with high grade 10%-30% TGC samples spread-out across the prospect. Step-out test pitting and trenching has successfully extended the mineralisation strike length by 100% from 2.5km to over 5.5km which means BKT has potentially confirmed Ulanzi as a larger prospect than Cascade. BKT’s exploration target at Ulzani is 41-52 Mt @ 9.36%-10.42% TGC. 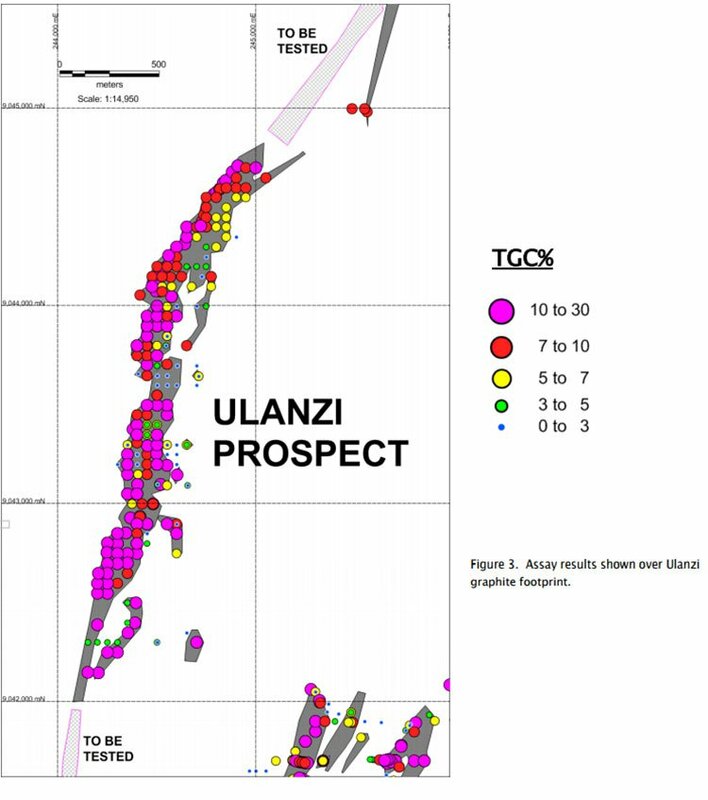 In total, the Ulanzi prospect now has 17 holes drilled with all of them showing consistently thick graphite intervals. BKT plans to drill a further 20 which are hoped will corroborate previous results. Future catalysts are likely to occur with upcoming results from Ulanzi and Cascade – given the geological work BKT is doing on these two prime prospects. These results will go a long way in deciding whether BKT is able to prove up a resource by the end of 2015. 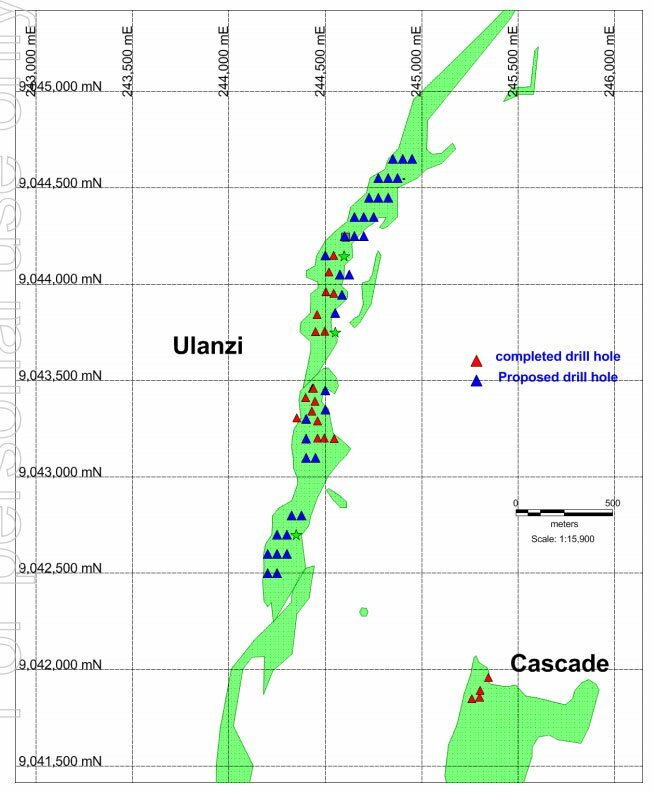 Here’s a map showing BKT’s completed and proposed drill holes at Ulanzi. This series of drilling could serve as a catalyst for BKT as and when the drill cores are analysed and made public to the ASX –in the coming weeks. Within the past 3 months, BKT has transformed the unexplored Ulanzi from a prospective curiosity into a significant prospect with excellent resource potential, following the discovery of a 5km+ graphite mineralised structure. BKT’s results mean that every single additional hole drilled at Ulanzi is likely to add resource tonnes to its final JORC calculation. As these drill results are incrementally added, it could well mean BKT’s valuation rises in parallel. At same time, it is recommended that investors do their due diligence and seek professional advice before making any investment decision. 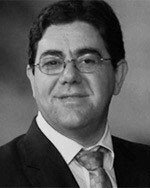 Mr. Stephen Copulos, owner of the ‘Copulos Group of Companies’, Australia’s second largest KFC franchise owner, joined BKT’s board as Non-Executive Chairman in January 2015. Mr. Copulos is a major shareholder and financial supporter of BKT which given his previous track record, could be what seals BKT’s prosperous future. Here at Catalyst Hunter , we take note when we see a company’s Board and management buying up stock in the same company they are steering. It usually means confidence is high. In the case of BKT, Mr. Copulos put in $1M of his own money just days ago. Other senior personnel contributed significantly. Do they know something we don’t? Management loading up with shares is a positive sign; and can sometimes be a catalyst in its own right. These guys aren’t in it to trade a few pips, they are in for the long term. Furthermore, BKT has also finalised all its funding commitments for the foreseeable future by securing $5M in a capital raise aimed at sophisticated and institutional investors . The funds will help to finalise a JORC Resource for BKT at Mahenge and commence exploration on its new acquisition – Bagamoyo. Originally, BKT was intending to raise $4M but following “strong demand” the funding round was closed at $5M. It’s worth noting the placement went through at a 50% premium above BKT’s Prospectus offer in March 2015. 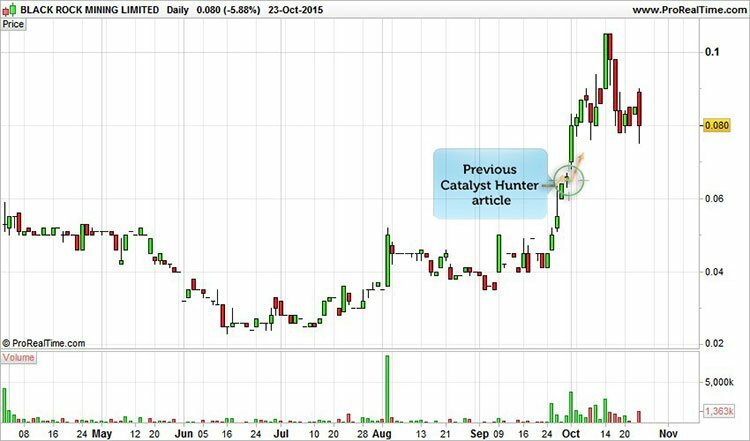 Investor over-subscription is always a good sign for catalyst hunters. With a JORC resource on the horizon, over 2,600km 2 of exploration ground, and a location right next door to a defined ore body belonging to Kibaran Resources (ASX:KNL), BKT is on the right path to seeing its valuation reappraised as more results come in. BKT is currently capped at just $17M, and represents an early stage entry into the graphite exploration scene in Tanzania. The Company is well funded and has significant news flow set to unravel in the coming weeks and months. BKT is a junior explorer with a lot of exploration still to do. However, its results to date and looming JORC resource suggest this junior may soon have a comparable resource to its dominant neighbours Kibaran and Magnis. Mapping and evaluation of BKT’s most recent asset (Bagamoyo) is expected to be completed by mid-November 2015 and BKT is likely to update the market of its findings shortly after in late November or early December. A price catalyst is on its way – the only question is, which one of BKT’s prospects makes it through the JORC rubicon first. Catalyst Hunter presents this information for the use of readers in their decision to engage with this product. Please be aware that this is a very high risk product. We stress that this article should only be used as one part of this decision making process. You need to fully inform yourself of all factors and information relating to this product before engaging with it.